I think it is very helpful for this info to be shown on push messages BUT... how about including the DATE of completion also? Currently I am 1/2 way through a 5 Day print. Informer Pops up on my phone every 4 hours and tells me... Print will be completed at 11:30PM. Which day Ol chap? It's NOT 1130PM tonight or tomorrow? So, in the end showing the Est. Completion time is pointless if there is no date included. Repetier Host doesn't show a specific completion but rather HOURS until completion. Why isn't this consistent between platforms? How about a fix on this please Repetier Dudes? Host shows both if you click on the message in the status bar it toggles. Is this for host or server? For such big prints like you seem to do I would expect you to use the server which is much better with big prints. Dito :-) You did not say if that was was with server or host. Never used that feature myself so I do not know which one does what, so hoped on a fast answer so I could just jump to the right source and not needing to test myself when I have time left. Not so sure with time left as that depends on when you read your message, but of course you could interpret it from the receiving time of view. So I'm willing to adjust it if I do not forget it. Informer is a dump software that only shows what others send, therefor I need to know which sender does omit the date. I know exactly what informer is (& what it is not LOL). I don't think that you are understanding me? I do not think that the user(s) has anything at all to do with my request since the SAME information is being pushed to ALL users. I am attaching 2 images to this messages. The first is a screen shot of where you configure Informer to send you push messages. In this case I have the "Progress Every" box checked. When this message is sent I get the 2nd image on my phone. As you can see the message was sent to me on 10/26/17 of 5:54 AM. The message states that the print will be finished at 1:33AM. You with me so far??? 1:33AM on what day? The 27th the 28th the 29th??? 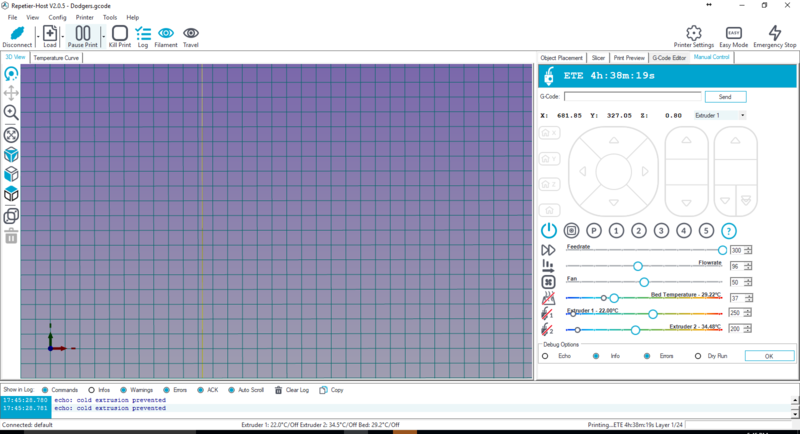 This print will take approx 125 hrs to complete so it will definitely NOT be finished at 1:33AM on the 27th. The message SHOULD state "Print will be finished 10/29/17 at 1:33AM. Does that makes sense? OR the alternative would be for the message to state the same thing that Host shows as an ETE which is 125 HOURS until completion. Hopefully this clarifies and you can implement this change as it will actually make the progress report clear. THANK YOU! Yes I had understood that part. Just thought you thought the informer would create the date. So everything clear now. So... it's been over a month since I posted this simple request. I have noticed that a few days ago that Repetier Informer was updated via Google Play however, this issue has not been addressed. 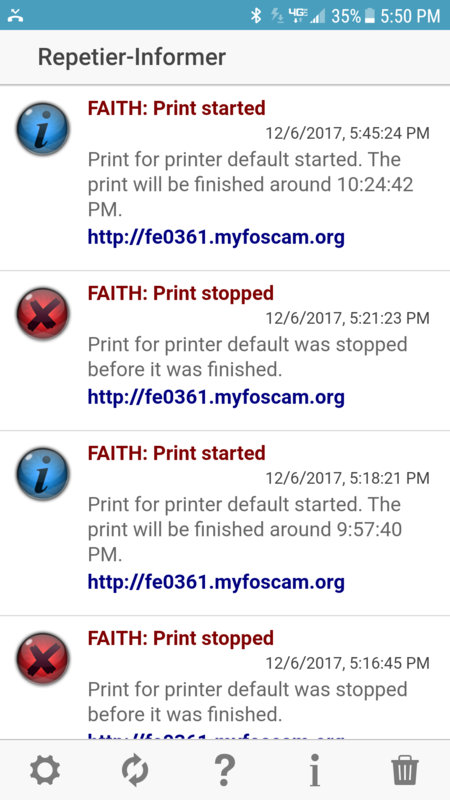 As previously mentioned Informer reports when a print should be finished in a 12 hour time format see attachment where it shows print will be finished at 10:24:42 PM. HOWEVER, Host shows ETE in Hours Mins and Seconds. CONTRARY to waht is reported earlier in this post, I cannot get my version of repetier host to "toggle" it only shows Hours, Mins & Secs. So... First off there is a disparity between the 2 time formats. Second... Can Informer PLEASE include the DATE AS WELL AS THE TIME that the print will be finished. Some prints take longer than 24 hours and without including the Date the expected time to be finished that is being reported currently in Informer is USELESS! It's not the informer deciding what to show. It is host or server which need to be changed for this and there we are now ready with a new version. I believe you but, it doesn't make sense what you are saying.... If Repetier Host ONLY shows ETE in Hours Mins & Secs then what is converting these hours into a Solar Time (i.e. 10:24 PM)? Whatever... I really don't care- Can yo just fix it please? When will the new version be ready? Host does make the the text and sends it. Currently we are working on server update, so host comes after that. Since it is a bigger update I can not say when host update comes.